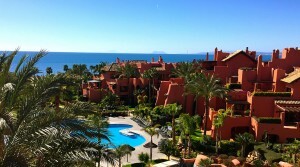 Torre Bermeja is an elite beachfront development situated on Estepona’s New Golden Mile. Situated in a privileged position the stunning views of the Mediterranean Sea and Sierra Bermeja mountain range (where the urbanization takes its name from) encompass this desirable community. Torre Bermeja is renowned for its five star facilities such as 24 hour security, two outdoor swimming pools, a heated indoor swimming pool, two gymnasiums, a sauna, Wi-Fi, and is conveniently located with direct access to the beach.